Please send some awesome, quality stickers :) Same rules as usual...read below and happy swapping! 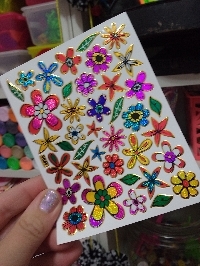 Send your partner 5 full sticker sheets. A strip of 4 small or 2 medium mods can count as 1 sheet (Mrs. Grossman's etc.) otherwise, sheets must be a minimum of 3" x 4" in size. No reward, alphabet, or word-only stickers allowed. No sticker flakes or teeny tiny stickers. No foam, 3D, cardboard or cardstock stickers. Please do not bend or cut sheets. Use appropriate envelope. Please no kiddo stickers unless your partner wants them. This is senders choice, but I have had complaints about children's stickers being sent. To help define these, let's say things like Spider-Man, Dora the Explorer, and overly cartoonish characters etc. count as children's stickers. Things like rainbows, hearts, owls, etc. do not. Let's not overthink it, but stay away from cartoon characters unless listed on profile or checking with your partner first. Looking at your partner's profile is always nice, but this is NOT profile based. Senders choice with the caveat above. I reserve the right to excuse anyone from this swap if I feel that there may be issues with this fabulous happy mail experience. Thank you for the restrictions for this swap. It helps receive quality stickers. @christieAnn566 For this swap, I would stick with store-bought sheets. You are welcome to check with your partner though. Thank you!